ctfo clicks – 💗 CTFO, Inc.
Why Become a Free CTFO Associate? CTFO Clicks… Results are in! My first 45 PPC click test package results are here, and the general consensus is… favorable! My experience using lead capture pages, just for people to get more info on a biz that *has* up-front costs, is a 20% optin rate. That is considered good. Above that is exceptional, below is sub-par. You have to consider as well, that at 20%, those are just tire-kickers, and actually getting a person to join that paid biz, is roughly 5% or 10% of those who opted in to learn more. If you want success, advertising is like death and taxes… Just a fact! With ChewTheFatOff, we completely eliminate this cumbersome “optin to learn more” method, and go straight to the “start your residual income home business now” approach, and it works way better. Each and every referral that you send is linked to you, and as soon as they decide to grow their home business, all of the websites, and tools are already set up for them. Even with the time lag in between when they join, and the light bulb in their head turns on, as soon they begin to refer others, your network grows as well. It is a thing of beauty! I expected 15% to 20% signup ratio. Actual was 15%. Here is the breakdown: My 45 PPC click package resulted in 7 referrals into CTFO over a three day period. Day 4) …Wish I had more clicks! 10% overage, so 50 clicks total. Based on my results, I communicated to Stuart Finger, CEO of ChewTheFatOff, that the $29 Entry Level PPC click package should be removed. They had already decided to do that. It is simply too small a package to gauge real world results. Too many variants from day to day, and more clicks, over more days, will produce better results. Although expensive, search engine pay-per-click is by far the easiest. As you guys know, anything that is easy tends to cost more. That is true for just about any product or service, in any industry. To date, I have referred 428 people into my ChewTheFatOff biz. The team has referred over 1700 more people and it is in early viral stages. My average cost for those 428 referrals in advertising and promotion is $4.50 per referral. Example: a 100-click solo ad (email clicks are different than PPC clicks) may bring in 20 to 25 referrals, and costs roughly $100. Traffic Exchanges, my #1 source, are relatively cheap, yet I have to generate 2500 to 3000 views every 24 hours to get 2 to 3 referrals a day from them. Roughly 1 for every 1000 views. It costs $15 to $20 for 3000 credits. That comes out to $5 to $6 per referral. I surf at least three days a week to keep costs down and traffic flowing. Safelists are very similar to that. They do cost more than exchanges, yet produce referrals with 1/3 the views. They also deliver much less traffic. Postcards are effective, also expensive too. Just think of the postage alone. 428 referrals, have cost me about $1900 spread over 6 months (it has been self-funding for four months now). Do you see how this is achievable? We can argue that each referral is expensive, and they are. That is just the nature of online marketing. That is also why the absolute most cost-effective method to use is the Super7 offline sampling program, to get into profit quickly. Even then, the Business Builder Package is $99 + shipping. This was the first CTFO Clicks test round. The 45 PPC pack cost $49 (no tax or shipping). $49 divided by 7 = $7 per referral. Before you shudder at that, the cost comes from ease and effectiveness. Think about the footwork and cost in mailing postcards, setting up an email solo ad, time spent surfing traffic exchanges, earning credits and mailing out safelist ads, etc. Plus, these are actual members into your biz, not people asking for more info that then have to be convinced. Login to your ChewTheFatOff backoffice. Buy a CTFO Clicks package. Done. Acquiring a customer has a cost in any type of business. Step back, look at the big picture, and ask yourself: Would it be worth $500 for 80 personal referrals? If you are serious about building a residual income home business, it should definitely be worth it. If your answer is no, then you want to win a lottery, not build a business. Remember, it cost me $1900 over six months for 428 personal referrals, and it took a lot of work. To do that easily, and effortlessly with PPC, using my actual stats above, it would cost you about $2500 (average $416 a month). A $600 difference. I would have gladly paid that extra $600 if it meant I could have spent much less time and work to get there. I am definitely buying more CTFO Clicks! So, if you see the value and want easy, convenient, and have it be virtually effortless to refer people, PPC is the way to go! Author Jose Garriga JrPosted on April 18, 2016 September 15, 2018 Categories Successful Network MarketerTags ctfo clicksLeave a comment on CTFO Clicks… Results are in! We get paid solely on voluntary purchases from everyone we refer, on a residual, weekly basis. 1000 referrals to financial freedom. Start referring to CTFO today! 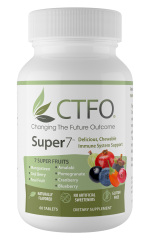 Super7 is my absolute favorite non-CBD CTFO product. got questions about ctfo ? Jose Garriga Jr is an independent distributor, just like you, not a CTFO employee. Click red button above to call Jose's cellphone anytime!